1. Do not expect your doctor to share your discomfort.Involvement with the patient’s suffering might cause him to lose valuable scientific objectivity.2. Be cheerful at all times.Your doctor leads a busy and trying life and requires all the gentleness and reassurance he can get.3. Try to suffer from the disease for which you are being treated.Remember that your doctor has a professional reputation to uphold.4. Do not complain if the treatment fails to bring relief.You must believe that your doctor has achieved a deep insight into the true nature of your illness, which transcends any mere permanent disability you may have experienced.5. Never ask your doctor to explain what he is doing or why he is doing it.It is presumptuous to assume that such profound matters could be explained in terms that you would understand.6. Submit to novel experimental treatment readily.Though the surgery may not benefit you directly, the resulting research paper will surely be of widespread interest.7. Pay your medical bills promptly and willingly.You should consider it a privilege to contribute, however modestly, to the well-being of physicians and other humanitarians.8. Do not suffer from ailments that you cannot afford.It is sheer arrogance to contract illnesses that are beyond your means.9. 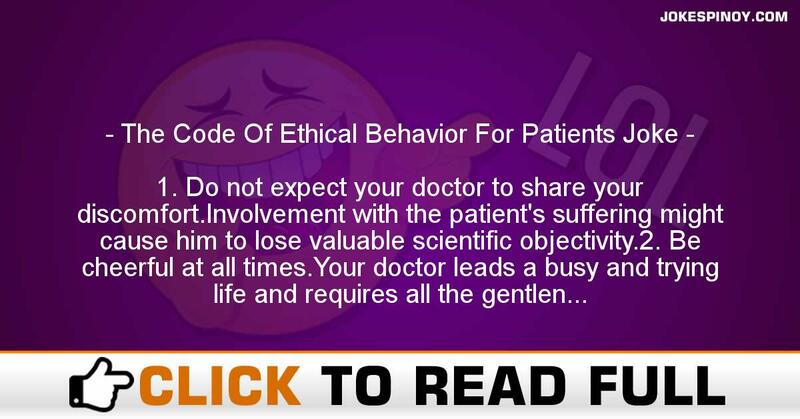 Never reveal any of the shortcomings that have come to light in the course of treatment by your doctor.The patient-doctor relationship is a privileged one, and you have a sacred duty to protect him from exposure.10. Never die while in your doctor’s presence or under his direct care.This will only cause him needless inconvenience and embarrassment. ABOUT US : Laughter is the best medication as the old saying says, we at JokesPinoy.com will give you all the comical filipino quotes and photographs in tagalog language. Back in 2013, a group of Filipino OFW (Overseas Filipino Worker) got bored and they attempt to look for some humorous quotes online just to have fun but sadly most of the websites they found on that time are having an obsolete jokes and have no interaction with the users. From that moment, they subsequently got an idea to build their own jokes website and let other users to give their jokes or comment together with the present jokes. Following the funds and concepts accumulated, JokesPinoy.com was born, a website that let the user share their jokes and let them have conversation with other users too. Since the website has been launching, thousands of visitors are coming each day to read jokes and have fun on the website and too as giving their view on the jokes they read. We hope from JokesPinoy.com this website may give you some grin and happiness, Life is Short so have fun on it. DISCLAIMER: A number of the jokes, pictures and videos found in this site aren't created by us, they may be made by our users or they simply get it someplace in the web just like 9gag, youtube, metacafe, vimio and etc. We respect copyright info that is posted here including funny pictures and funny videos. If encase there are files posted here in our site that is owned by your and you don't desire to share it to anybody subsequently fell free to contact us to remove it. Majority of the language used on this site was in tagalog and some are bisaya that are both filipino language which originated from Philippines, in case you need to translate the joke to english you can used an online translator to translate it from tagalog to english.